-Salt and pepper the meat, rub with the 1 tablespoon of canola oil, and set aside. -Combine the 2 tablespoons of mustard with the 2 tablespoons of oil, the garlic, and the rosemary. Season the mustard sauce to taste with salt and ground black pepper. -Heat a large cast iron skillet to very hot and add the 1 tablespoon of canola oil. When oil is shimmering, carefully place the rack of ribs in the skillet, balancing it with tongs so the top side of the rib meat is in contact with the skillet. -Brown well, about four minutes, then turn and repeat browning on the other side, about two more minutes. -Move the pan from the heat and remove the browned lamb to a rimmed sheet pan. Liberally slather the meat on both sides with the mustard mixture. 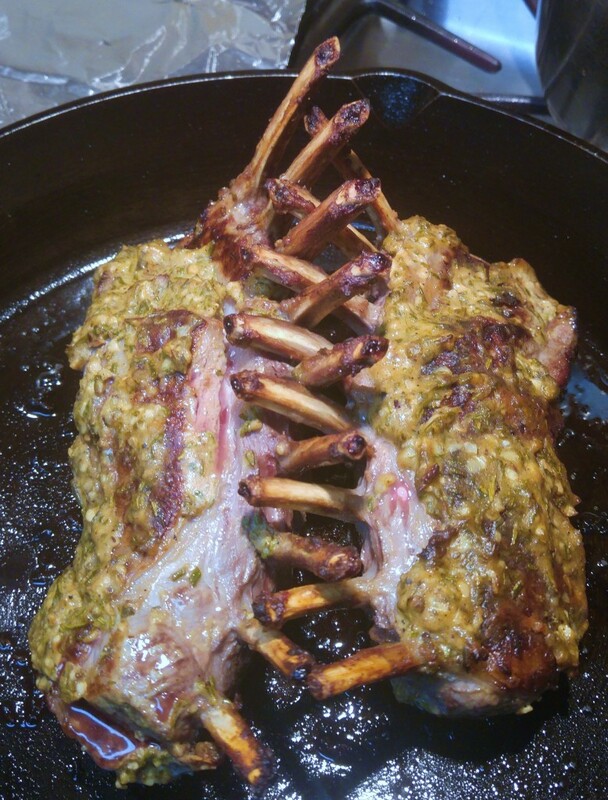 Place the lamb rack back in the skillet, bowed side up. -Carefully move the skillet with the lamb into the preheated oven and roast for an additional 12-15 minutes, or until internal temperature has reached 125 degrees for medium rare or 130 degrees for medium. -Slice between the ribs (I like to slice between every other rib so each person gets a nice thick two-rib chop or two). -Drizzle with any juices collected on the baking sheet.